Rooftop Reviews: The Picasso from Rocky Mount, N.C. The following remarks were delivered yesterday by Eddie Ray of the North Carolina Music Hall of Fame at the ceremonies honoring Thelonius Monk, which took place in Rocky Mount, N.C. I was privileged to be asked to write a little something befitting of the occasion; and glad to do it. My original draft was a little bit different in that it included 3 paragraphs which Eddie Ray chose not to speak, thus proving his legendary talents as an accomplished Artists and Repertoire (A&R) man. I have been known to go on tangents and need minding. So, here is the text of the remarks as written by me and edited to a fine edge by Eddie Ray, and then spoken at the ceremony. It was an honor for me to write about Thelonius Monk; and although I might not be the number 1 fan as purported in the in the opening remarks; I do recognize the genius of the man. “The leaves would have been turning; just as they are now. Look around outside at the beautiful colors surrounding us; these were the first sights that the boy would ever see. And though he traveled far; would they ever leave him? The sounds of his first winter would have been full of the wind as it howled and blew through the hills; and when it froze he would have heard the cracking of the tree limbs as they broke away from the trunks, crashing, quietly muffled on the snow covered ground; crashing quietly; just like the struggles evident in his music later on; when discordant notes fought for a place among sweeter melodies. Could his senses have ever really forgotten from where that came? Surrounded by the colors and SOUNDS of these hills and mountains where he was born had to have helped form the mind of the boy who would someday mesmerize the world with his unique SOUNDS. And although he would leave these hills at an early age; he was only 5 years old when his family moved to New York City; this is where he came from. After moving to New York, where the people today still claim him as their own; it seemed like everybody wanted a piece of him. A largely self-taught musician, he did attend Julliard for a while; where it must have been difficult for him to contain his musical visions within the confines of a structured school setting. But, at age 17 he toured with a gospel band playing the organ for a few years before forming his own ensemble. After that, came the legendary years, which produced such classics as “Round Midnight” in 1947. Photos of him at the time; he was 30; show a sharply dressed and focused man. I could go on about all his great achievements in the field of Progressive; and even Advant Garde Jazz, but all of that has been covered elsewhere by others. You didn't come here to hear a biography. You came here to celebrate a great musical SOUND. Somewhere, sometime; there was a note, or possibly a melody, which entranced you and drew you in, And then you were hooked on that “SOUND”. 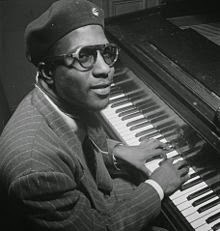 Thelonius Monk was that SOUND personified. And his entire life; until his death over 30 years ago; was a continued exploration of just how far he could take that SOUND, from Rocky Mount, NC to New York City and to every city in the world he took his SOUND he refined it each step of the way , adding something he heard here; and a note he heard there; until those combined SOUNDS became the soundtrack of his own life and travels; and the lives of those that traveled the musical path with him. On behalf of the NC Music Hall of Fame, I am honored and grateful to have the opportunity to help preserve, honor and promote Thelonius Monk’s extraordinary contributions to the rich musical history of our State of North Carolina and to the entire world. The memory and enjoyment of his amazing musical contributions to the world of music will live on forever.